Usually there is no connection between the Gimpel Beynish cartoons and the news of the day. I imagine that Sam Zagat delivered a sheaf of cartoons every once in a while and they got published as he wrote them. I wonder if Notke asking for more than a penny for his silence and subsequently getting booted out of the frame was just coincidentally related to the strike reported in the same paper. January 20, 1915: He conducts a successful experiment concerning flying. GB: Take a penny, loafer, and get lost. I need to talk with somebody about an important matter. Motke: Go, right now you can get a penny from Papa. He's making a match, he doesn't want to be bothered. GB: So, why are you standing here like a clay dummy? Surely you see I'm busy with somebody. GB: I see you don't know that we're in America and that I can make you fly. So take that. 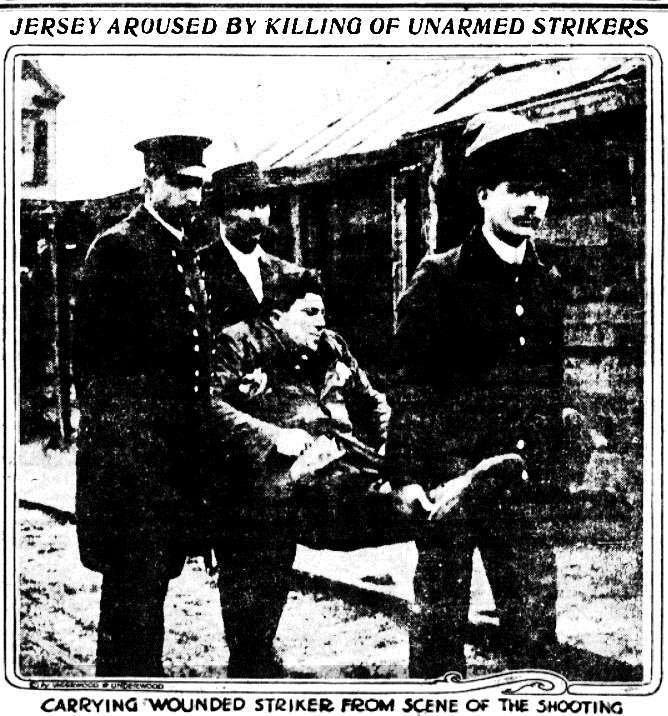 FOURTEEN SHOT IN LABOR RIOT -- 250 STRIKERS AND DEPUTY SHERIFFS IN PITCHED BATTLE: Roosevelt, N. J., Jan. 19-Fourteen men were shot, four of them being mortally wounded, in a pitched battle between 250 striking laborers and fifty deputy sheriff at the plant of the American Agricultural Chemical Co. here today. ער מאַכט אַ געלונגענעם עקספּערימענט װעגען פֿליהען. גימפּעל בײניש: נאַ, לױפֿער, נאַדיר אַ פּעני און טראָג זיך אָפּ. איך דאַרף רעדען מיט אַ מענשען מכּח אַ װיכטיגען עסק. מאָטקע: געה, קענסט איצט קריגען אַ פּעני פֿונ׳ם פּאַפּאַ. ער רעדט אַ שידוך, װיל ער גיט מען, זאָל איהם באַדערען. גימפּעל בײניש: נו, װאָס האָסטו זיך אַװעקגעשטעלט װי אַ גולם? זעהסט דאָך, אַז איך בין ביזי מיט אַ מענשען. גימפּעל בײניש: זעה איך דאָך אַז דו װײסט ניט, אַז דאָ אין אַמעריקאַ און מען קען פֿליהען אײַך. 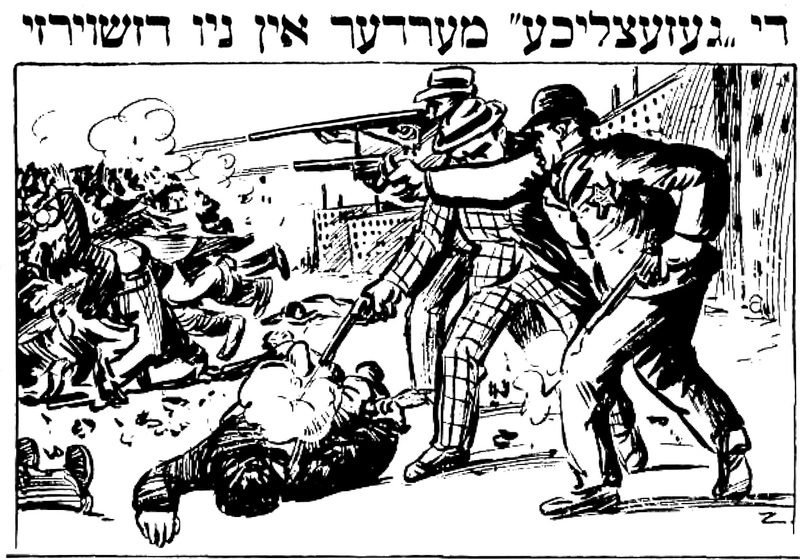 טאָ נאַדיר.